Part 2 of our trip to the Great Wide Open was spent tearing up delicious desert single track in and around Grand Junction and Fruita. Martin was still on Euro time but wasn't going to waste a second of daylight. Sleep when you're dead is what I always say. The plan for the day was to take everyone up to the top of the Ribbon. This would be the first time for the girls and I was excited for them. It's a lot to bite off if you haven't ridden that type of terrain. The plan was for everyone to ride the Ribbon and then the Todds would break off and ride Eagle's Wing to Eagle's Tail and we'd meet them in the parking lot of the Lunch Loops trail system where RF would be waiting. The rest us would make our way to the Lunch Loops via Andy's Loop, a supposedly easier route. Ahem. The day started with a few issues but we stayed on schedule for the most part. Since this was the only ride of the day, we weren't in a huge hurry. Clouds were abundant so we just had to keep an eye out for any organized storms. It was hard to once again leave Ryan behind. This is one of his all-time favorite rides and even though he put on a big grin, I knew he was aching to come with us. Up on top of the parking lot in the sky as I call it, the girls were ecstatic. I remember the first time I did that ride. I was scared and mesmerized all at the same time. The plateau tilts downward so no matter what, you are descending and it's easy to pick up speed quickly so you have to ride back and forth, much like skiing, if you want to maintain control and not cook your breaks. For the most part you can see where the big slots are in the surface but you can never be too careful. The view is breathtaking. The Book Cliffs to the east are in full view normally, but due to drifting smoke from fires in Wyoming, the sky was hazy. Closer to us were the ridges that pierced the earth and jutted up at violent angles; a living testament to the tectonic techno party that shaped the landscape eons ago. After many jaw dropping minutes accompanied by hoots and hollers, we eventually made our way down to the first hike a bike section. These wouldn't be so bad except that normal people like us have to hand down bikes and also then have to slide down on our butts. The slick rock is amazingly clingy but not always. We all made it down unscathed and I was hoping that this part wouldn't freak out the girls. We had a long way to go. But they were champs. 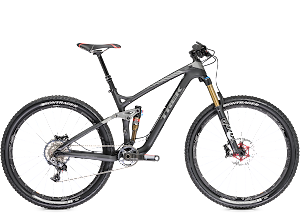 There were a couple of step downs that I rode down thanks to my dropper seat post and newly polished tech skills. F-yeah! As our coaches said, ride like a 14 year old kid and practice every bump along the way and that's what I did. There was one particular step down that didn't go as planned and even though I was aware of the sand I was heading into, I still managed to eject myself. After about an hour or so we made it to the point where the Todds went their way and we went ours. That's where the adventure began. We had a map and trail was marked. It took us in and out of a rocky spring bed. Soon we came to another sign that was part way up the cliff. Martin got out the map. I volunteered to recon. It was more of a hiking trail. There were flags marking where a new trail was going to go below me. I got to an opening that was fortified with large boulders. I could see flags above me but thought, "This is dumb. This can't be right" So I went back down and as I did, I heard a bunch of laughter. It seemed Carly had sat on a cactus! She was fine but a little tender. 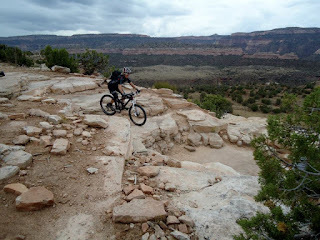 I told the group the trail was not rideable so we headed down the only way we could but it eventually ended at the edge of a cliff over looking a canyon. Crap! Where the hell did this trail go? I was getting grumpy. We went back to the trail marker and we all hiked our bikes to the little landing, handed them up one by one and continued walking. Anyone who has known me knows I HATE WALKING MY BIKE and this was no acceptation. Why would this be an option? It was way harder than Eagle's Wing and not rideable! We cut across the boulder field towards the Lunch Loops area. We knew where we needed to go but weren't sure how to get there. 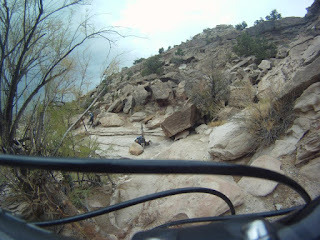 Eventually we found a rideable trail and I apologized to the group for my infant stomping antics. Andy's Loop actually turned out to be pretty rad. It wound us through blackened lava fields where the surface's crust changed colors at every turn. Each time the trail opened up, the views blew our minds. The trails were rideable and didn't have much exposure. There were a few areas but nothing compared to Eagle's Wing. We finally made it down to the parking lot. The Todds were already there. 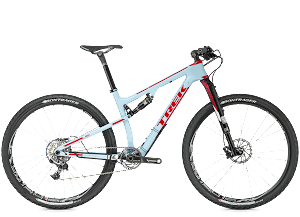 Also some of the Trek Dirt Series' coaches were there enjoying some unstructured riding, which was awesome for them. 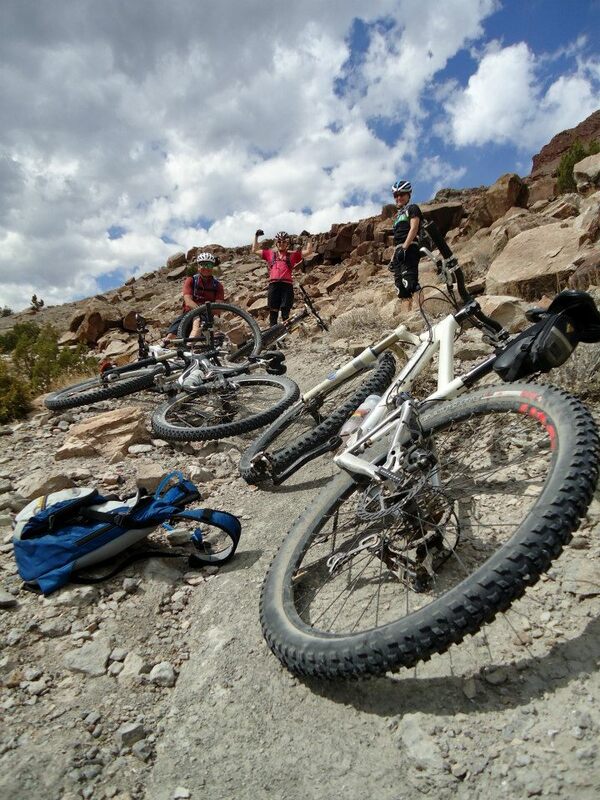 We rested up a bit and decided to ride around the Lunch Loops area as a group. There are some pretty gnar trails in there so to stay together we did Lemon Squeeze. When we got back to the parking lot we goofed around a bit at the jump park. Yeah, I still couldn't manage to get air. The night ended with some local BBQ and another night hanging out at the motel. Tuesday started with a rain delay. The sky was thick and heavy with storm clouds and a drizzly rain kept everything pretty wet. Radar signaled that the rain was coming in bands. We could see some clearing off to the south so we waited it out. That just meant lot's of coffee drinking. I rode into town for a breakfast burrito and a change of scenery. The rain had started to subside. Ryan was there with Martin doing some work stuff. We went over to the bike shop and bought some stuff. 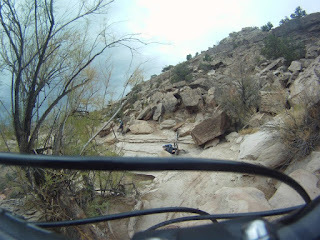 Finally, it was time to get the bikes packed up and onto some single track. The plan for the day was Loma Exit: Mary's Loop / Horsetheif / Troy Built depending on the weather. 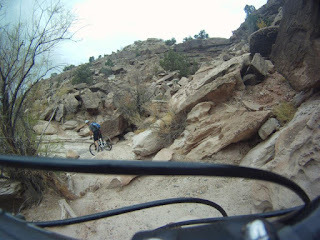 After we parked, Ryan skittered off to the Horse Thief drop in while we unloaded. As we began to ride I noticed my ever-failing Crank Bros seat post wouldn't pop up anymore. There was no way I could ride all day with the seat all the way down. I'd ruin my knees. Come to find out, I had moved the cable out of the way of the Go Pro causing the spring not to work on the seat post. Once we figured it out, I was back in action. 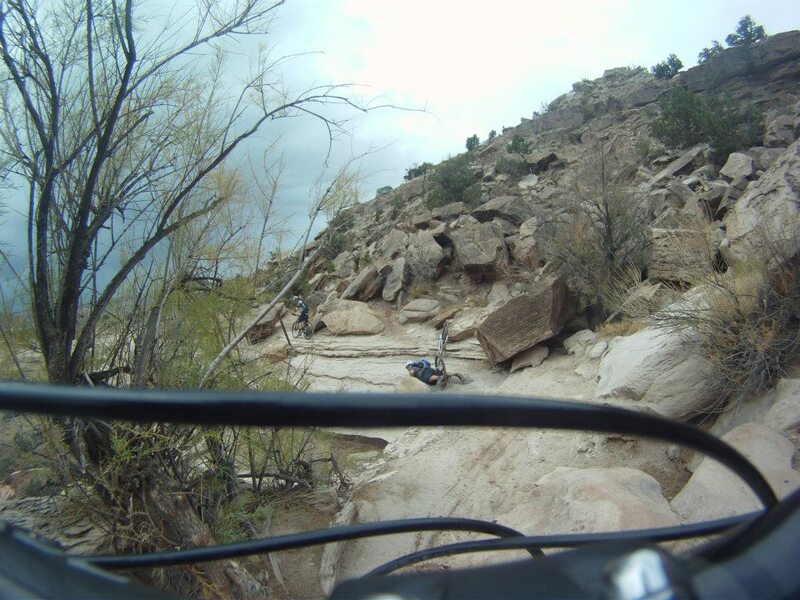 We rode up to the Horse Thief, stopping along the way to take in the panaramas before us. 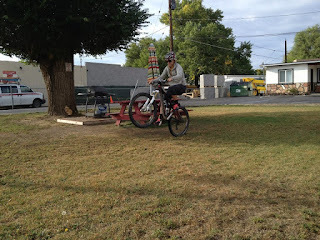 I talked a few of them into taking part in the ritual of hoisting their bikes over their head in a victory stance above the Horse Thief trail. We arrived at the hike a bike section that I had learned to ride at camp. We sessioned it a few times. I wasn't able to clear the last step at the top but I was able to ride the middle section. Victory! Once down, we did the whole loop and then had to climb back up! We continued on Mary's Loop for a bit. 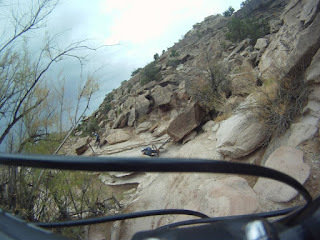 Martin got up close view of the trail when he went nose heavy down a drop. Thankfully, he only dropped once. I happen to have had the Go Pro on. Here it is frame by frame. In the last photo you can see how close he was to the ledge. Luckily that rock kept him from sliding off. The farther we went, the more worrisome we got. The sky was getting pretty dark towards Fruita and we could see the rain curtain coming towards us. We stopped and put on our rain layers. Good thing because we ended up riding in the rain for a good half hour. That's when Martin and April continued on via service road and the rest of us went on via single track. Once we were all back together, we decided to call it a day. I texted Ryan and he picked us up on a gravel road. 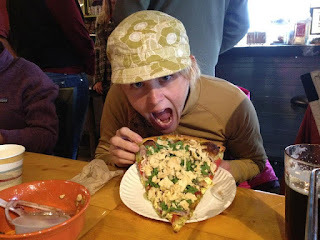 The rain continued to fall so we drowned our sorrows in mozzarella at the Hot Tomato. Rain doesn't mean we can't have fun, however. I think we were on our 2nd jug of whiskey and 2nd bottle of tequila and I don't even know how many beers. We spent our last evening at the motel practicing wheelies on the lawn. I'm sure they were glad to see us finally go.